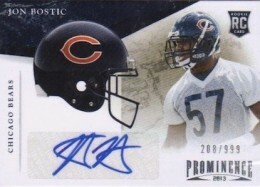 2013 Panini Prominence Football is another set that focuses largely on rookie autographs, but with a bit of a twist. Like last year, the release includes several different rookie signature designs for first-year players. A different box configuration makes it a little easier to break by the pack as well. 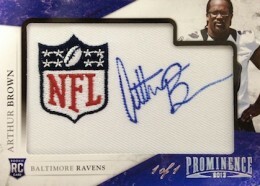 Every box of 2013 Panini Prominence Football has three autographs. Most are very distinct with how they not only look but feel as well. 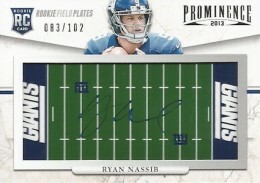 Rookie Field Plates Signatures use a signing area the resembles a football stadium's field. 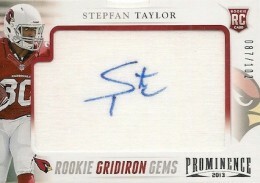 Rookie Gridiron Gems Signatures come over from the Gridiron line, which is not scheduled for 2013. These cards, which are numbered to 249, have a signed swatch that slides out the top of the card. Rookie Class Letter Signatures are signed on a manufactured letter patch. 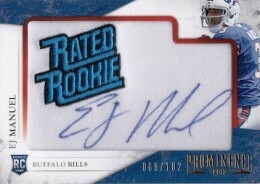 Rookie Embroidered Team Logo Patch Signatures are signed on a piece of jersey-like material and have a manufactured patch. 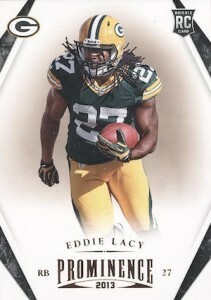 Parallels for the Team Logo cards include Rated Rookie (#/249 or less) and one-of-one NFL Shield patches. 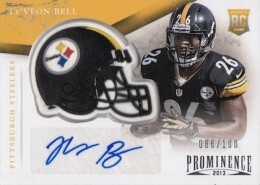 Rookie Helmet Signatures also return. 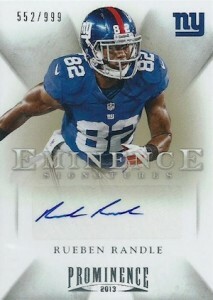 Other autographs in 2013 Panini Prominence Football include Eminence Signatures. Rare versions include two and three autographs. Last year, Prominence boxes had just one pack per box. This year, it's up to five packs per box. Besides the promised pair of autographs, boxes also have a pair of parallels. 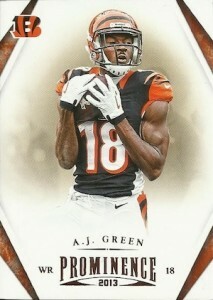 Very poor and super upset with Panini on Prominence this year. Bought 9 boxes and not one auto from someone who was drafted in the first 5 rounds. 90% of the autos were from players who are not on an NFL roster or on a practice squad. over a thousand bucks and not even an average hit. Very poor product. Just not a lot of value for what you pay for the card. The faux relics are cheap looking and tacky and the collation of the product was bad in the limited amount I saw. All in all, a lack of ingenuity and a price tag that doesn’t even come close to delivering the proper value in return. Unlike last years Prominence, Panini has created three mini boxes with five cards each. More for your money? I will say that the card stock from Panini is some of the best that I’ve seen. Great design and a nice subtle style. My hit from just one mini box yielded a auto patch pull out of Tyrann Mathieu. I don’t see myself continuously pulling the patch out, but it is a interesting feature at best. The stars just aren’t there. there either un-drafted or in the top 20 drafted, there’s no in between. i haven’t even seen any rams hits. last year, the stars were great and prominence managed to get those types of players unlike this year. overall, an average product to break a box or 3 but just not a whole freaking case with 15 boxes, unless just for the fun of it, not expecting to make any money back, haha. Lousy hits, very low chance for a decent pull, however it does come at a fair price if you disclude the fact that you only get 12 base cards per box. Bought a box of this at a $39 price point in Chantilly this past weekend as, off the top of my head, I don’t ever remember seeing it opened. I was sorely disappointed. 2 Ravens rookie busts and Marcus Lattimore…those were my autos. Clearly junk. Pass on this one for sure.